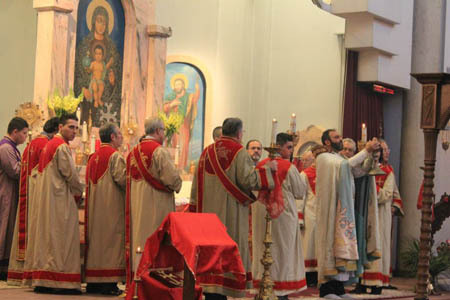 On April 8th, 2012 thousands of devoted faithful gathered at Toronto’s Holy Trinity Armenian Church to celebrate Easter, the miraculous resurrection of our Lord Jesus Christ. The Divine Liturgy was celebrated by His Eminence Bishop Bagrat Galstanian, the Primate of Armenian Church Canadian Diocese with Rev. Archpriest Zareh Zargarian, pastor of the church and Very Rev. Fr.Isahak Poghosyan assisting. 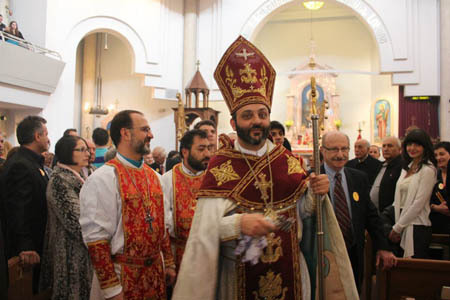 The clergy were joined by the deacons, sub-deacons, acolytes and the church choir led by Mr. Shahe Altounian. The faithful gathered at church experienced a mesmerizing and beautiful Easter service. Bishop Galstanian delivered the sermon on the Resurrection and invited all present to continue living their lives based on the principals they followed over the big Lenten period. 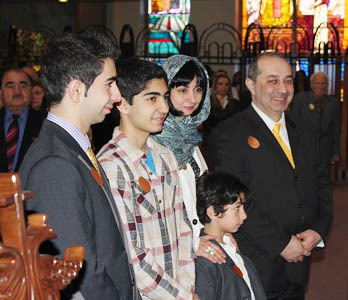 The Ambassador Extraordinary and Plenipotentiary of Armenia in Canada, Mr. Armen Yeganian and hiswife Maria and sons were present at Holy Trinity Armenian Church for the service. Fr. Zargarian invited the family to come forward where they received special blessings from the Holy Altar by the hand of His Eminence. A group of pilgrims to Jerusalem also received special blessings and prayers before joining the primate and Fr. Zargarian on pilgrimage trip departing the following day. We pray for the group to have a rewarding journey and return safely back to Canada.